Your commercial property has unique needs when it comes to flooring. You need a floor with a low lifecycle cost and minimal maintenance requirements but it also needs to be attractive for the public. Commercial epoxy flooring in Nampa, ID meets these needs and much more. Our industrial-grade epoxy systems are built for demanding environments and remain resistant to chemicals, harsh cleaning protocols, shopping cart wheels, forklifts, moisture, foot traffic, abrasion, and much more. Epoxy flooring is even easy to customize to match your branding with a bright and skid-resistant surface that makes your space safe and inviting. Ready to learn how your business can benefit from a low-cost and high-grade commercial epoxy system? CONTACT US for a FREE ESTIMATE. Commercial concrete epoxy is a durable coating system that can be used for a wide range of purposes. Commercial epoxy flooring is created by combining polymine hardeners and epoxide resins to create a chemical reaction. These chemicals combine and cure to form an incredibly durable plastic material that's bonded to your concrete. Our commercial epoxy flooring installers use only high-grade epoxy products for superior results. Commercial concrete epoxy in Nampa, Idaho is a hardworking flooring system ideal for all types of commercial applications. 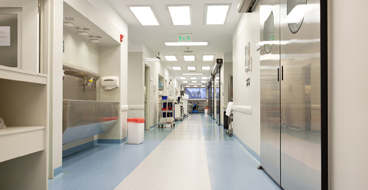 With a non-slip surface that’s decorative, easy to clean, and able to withstand heavy use, commercial epoxy flooring can be a smart investment for a medical facility, office building, hotel, grocery store, and much more. Here are some of the most common applications for a commercial epoxy floor coating in Nampa. 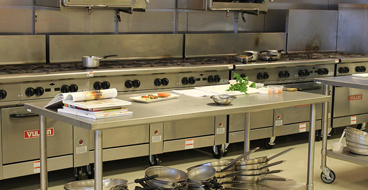 Commercial epoxy flooring is the perfect choice for a commercial kitchen. Commercial kitchen flooring epoxy in Nampa, Idaho is a USDA approved floor system that’s completely seamless and resists damage from harsh cleaning protocols, fats, oils, solvents, and much more. With no nooks and crannies, dirt and bacteria can’t hide on an epoxy floor. Retail storefronts and shopping centers need flooring that’s able to handle constant foot traffic, shopping cart wheels, and spills without showing stains and wear and tear. Commercial epoxy flooring in Nampa, Idaho delivers with a seamless surface that’s easy to maintain, decorative options, and a resilient surface that maintains its clean, professional look for years to come. 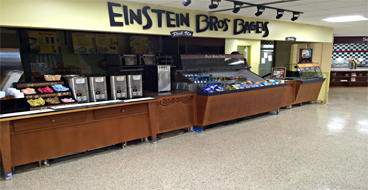 Thanks to its ability to resist constant foot traffic and our wide range of decorative finish options, commercial epoxy is a great choice for the public lobby of a hotel, retail store, shopping center, auto shop, and more. Decorative options like metallic epoxy coatings are the perfect way to create a “wow” factor when guests walk into your property. Commercial concrete floor epoxy can be used in a wide range of applications thanks to its seamless surface, attractive design, and hard-wearing surface. Our Nampa commercial epoxy floor contractors install epoxy systems for breweries, water treatment plants, grocery stores, schools, public safety buildings, and much more. We offer specialized formulations to meet the unique needs of any facility. We aren’t satisfied with sub-par results and rushed work and you shouldn’t be either. Our commercial epoxy floor contractors are committed to superior results that last with a combination of careful prep work and specialized high-grade epoxy. Don’t trust your commercial floor to inexperienced contractors who promise the lowest price. Your commercial floor is a major investment and the right flooring system has the potential to last 10 to 20 years. Choose the wrong contractor who cuts corners or uses inferior epoxy and you will be lucky to get a few years out of your floor. Our Nampa commercial epoxy flooring experts begin with thorough prep of your concrete floor that includes patching and repairs of issues like spalling and cracks followed by stain lifting and diamond grinding or shot blasting. This step is crucial because it prepares the concrete surface for a strong epoxy bond. Diamond grinding gets rid of imperfections from the surface of your concrete, opens the pores, and creates a smooth, porous surface that’s perfect for a flawless epoxy floor. Once the concrete is prepped, we start with a high-quality primer that prepares the surface for the epoxy and ensures a strong bond with the concrete. The final step is applying a multi-layer epoxy system with a topcoat that’s formulated to the needs of your facility and your design specifications.